It is the height of summer and the peak of the growing season. 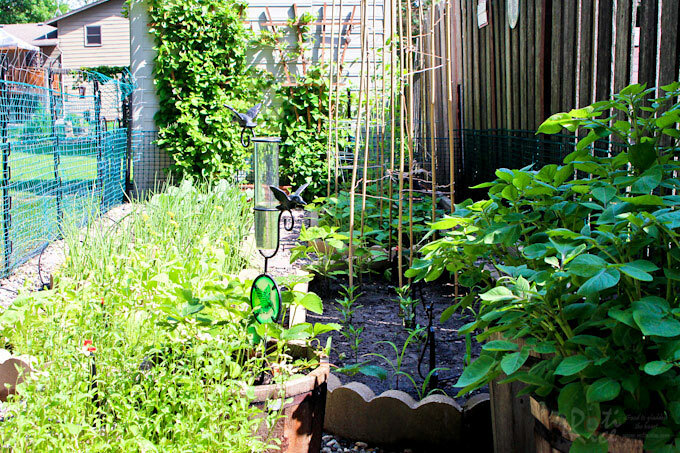 The plants are a-growing in our Vegetable Garden, much to my delight. From thin slender green onions to big cabbage leaves, our brown vegetable beds are now covered with different shades of green. 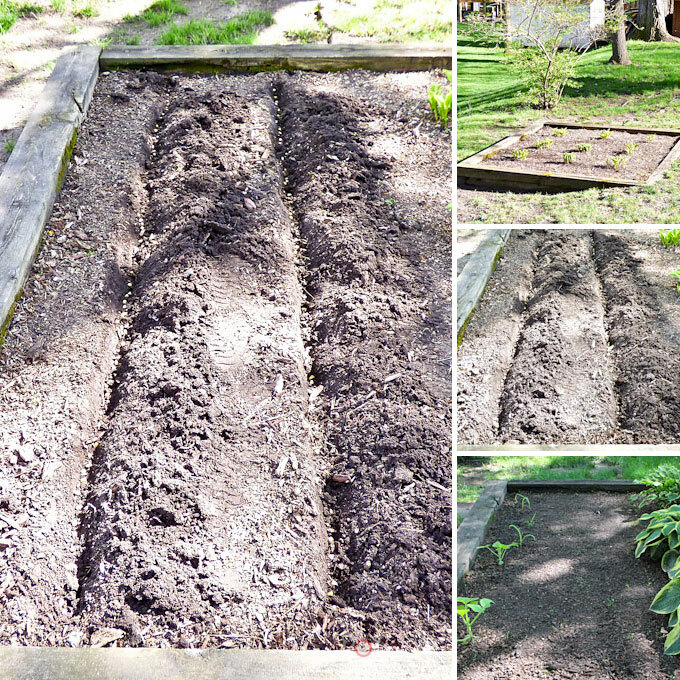 Every successful vegetable garden has its beginnings with serious groundwork, literally. 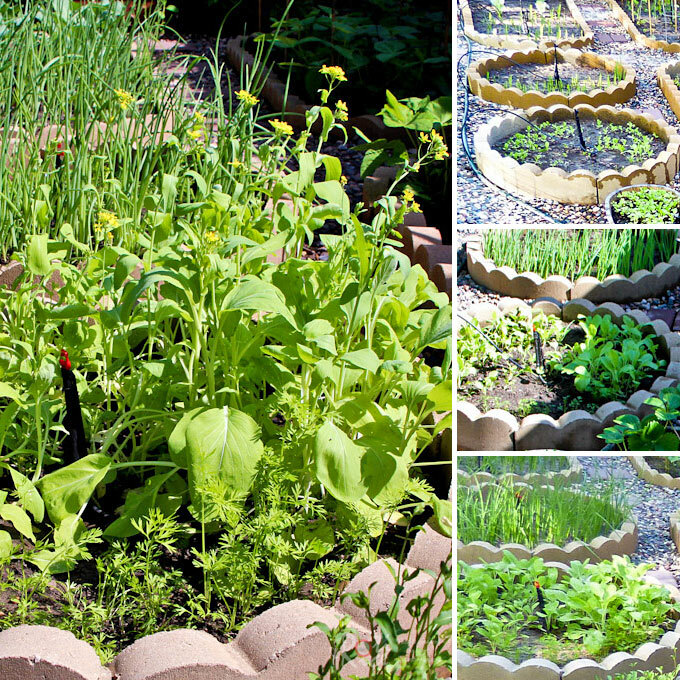 Planning Your Vegetable Garden is an essential step to a bountiful season with juicy greens for your dining table. There are many things that can prevent that from happening like crop failure, disease, drought, and pests of all sizes. After reviewing the way my plots were laid out last year, I realized that access was limited. When the vegetables grew, it was hard for me to work among the vegetable beds. So, early in spring, I set out to re-orientate the beds to create better and safer foot paths. 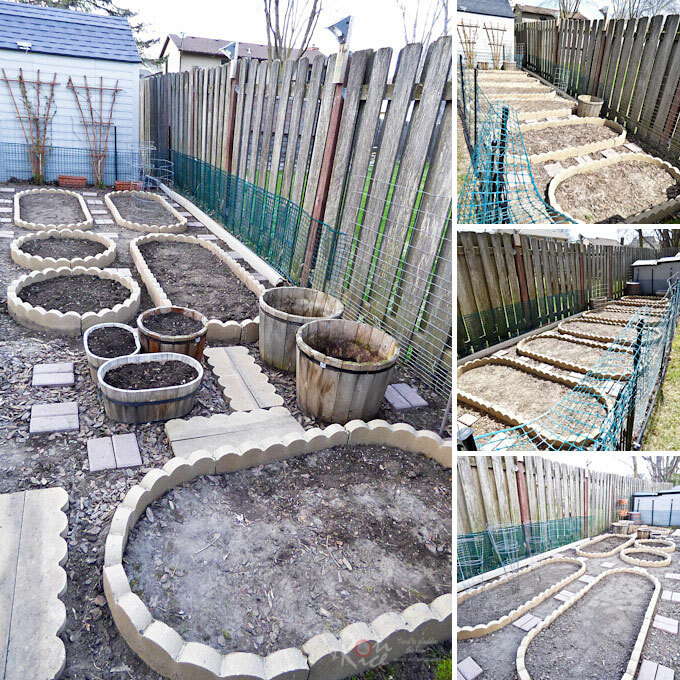 I realigned the vegetable beds to run parallel to the fence. The previous layout ran perpendicular to the fence. I reduced five full sized beds to three. 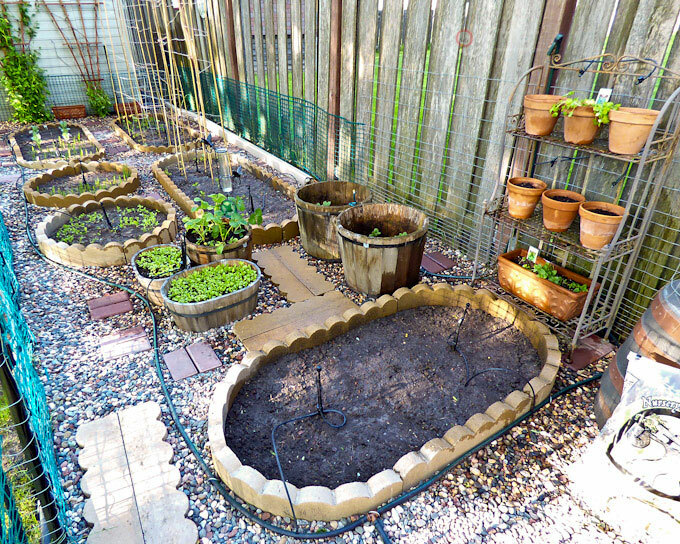 I left a smaller bed as is and created two circular ones to fit the slightly narrower part of the garden. 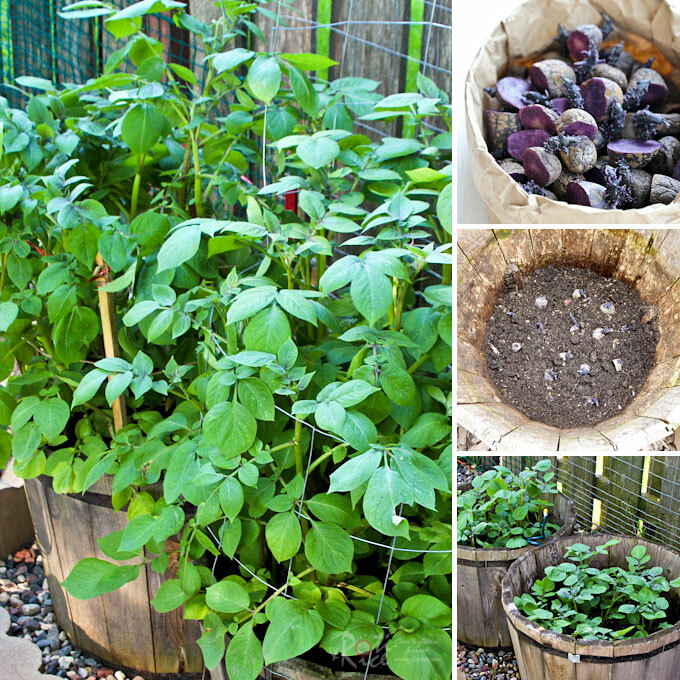 To make the garden look more interesting, I clustered several wooden barrels in one section for planting potatoes and to contain more “invasive” kinds of herbs and vegetables. I think this worked out really well. For even more charm, I moved my herb shelf from the patio to the garden. 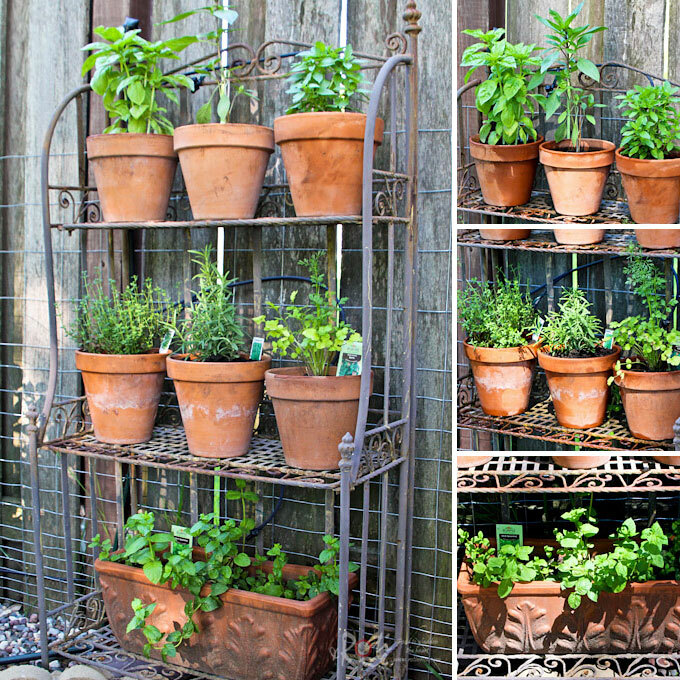 The neighbors fence made a rustic backdrop for the shelf and the herbs seem to like it there. Our yard is a relatively shady one and the only spot that has at least 6 hours of sun is about 75 feet from the house. Watering the vegetables was a challenge. Our arrangement last year was pretty ad hoc. We used a lawn sprinkler to saturate the area in a huge fence sweep. While that did the job, it created problems with wet leaves. Hence, mold and slugs became a problem. This year, we installed irrigation pipes instead. 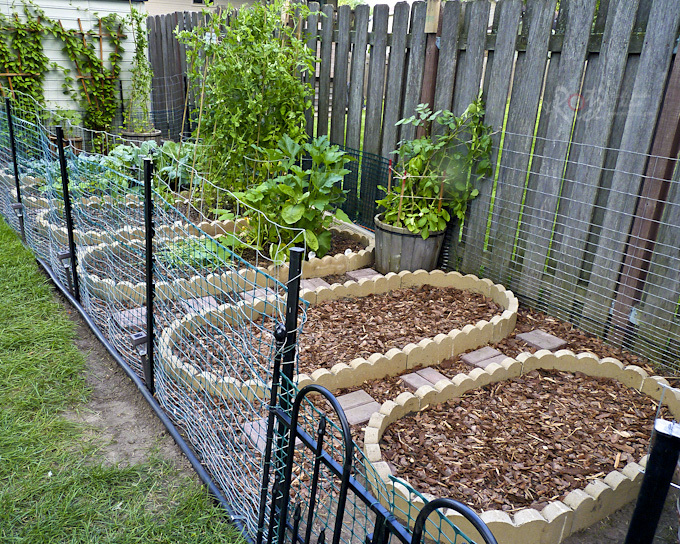 By running the beds parallel to the fence, it made it easier to lay down those pipes and micro irrigation tubing. 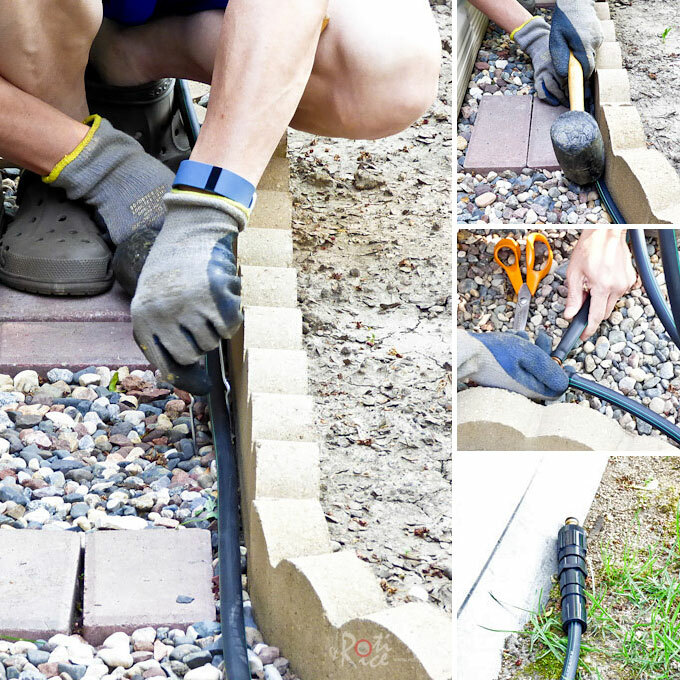 With this layout, we only needed to attach the hose to the head just outside the garden for a more consistent watering schedule. It also helped reduce the duration and amount of water used. We began by using the Rainbird Drip Irrigation Landscape Spot Watering Kit. Later, we augmented them with Mister Landscaper irrigation heads which are more suitable for our garden. We also replaced all the mulch from the foot paths with river rocks. It was hard work hauling 14 bags of 50 pounds each but I am glad we did. The garden looks so much brighter and cleaner now. It is drier and definitely more pleasant to work in. Hopefully the mold and slugs will stay away. Just as important as the ground work and the irrigation, protection from pests is fundamental to ensure a successful crop. 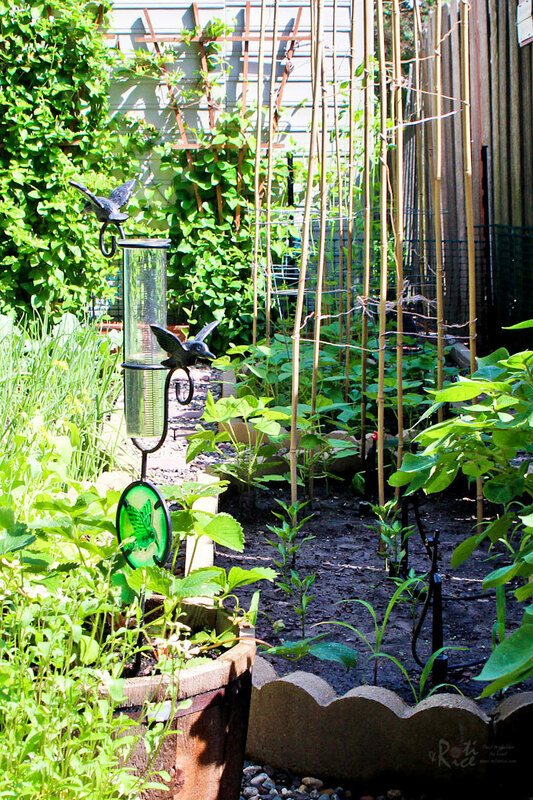 An unprotected garden in our neck of the woods would be decimated by rabbits, squirrels, and deer even before the young plants have a chance to develop. We inspected our fence for alignment and effects of frost heave opening up gaps between the lower edge of the fence and the ground. There were also misalignments caused by the strain of snow drifts pushing against the fence. After the fence had been repaired and reinstalled in some sections, our garden is once again made safe from the incursion of those furry thieves. Despite our precautions, there was a serious attempt to breach security by an intrepid rabbit. There was a concerted effort to chew away the outer plastic mesh. Fortunately, the creature was thwarted by the inner layer of Rabbit Guard. 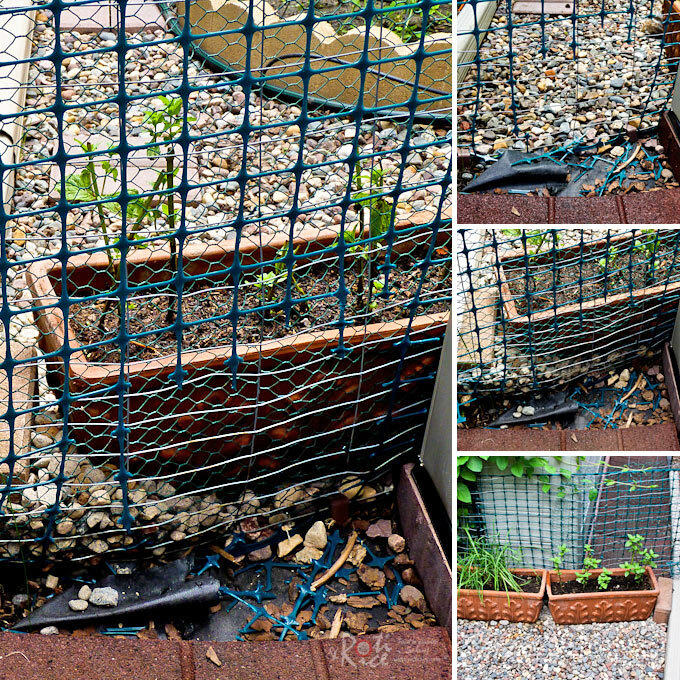 That particular section was quickly repaired and reinforced with a new layer of chicken wire, back filled with river rocks and bricks. We also placed planters with mint and Chinese chives to repulse any future lapine intruder. While the 3 feet fence was able to keep the rabbits out, it only helped somewhat to deter the deer. The juicy cucumbers tempted them too much and they made the jump into the garden. We found these Solar Animal Repeller which worked for about a week but they soon wisen up to the fact that nothing will happen to them. In the end, we had to put up a higher temporary netting to keep the herd out. This year I heard from a friend that a homemade deer repellent can be quite effective and so I am giving it a try. I beat one egg with one cup of water and strained it into a recycled household detergent spray bottle. Then I added one teaspoon of dish soup and topped up the bottle with water. I sprayed the vegetable garden fence with the mixture. It’s just been a few days but so far, so good. Ro-Ri San is skeptical and said that we should still put up that netting. This concoction needs to be sprayed after every rainfall, preferably on a calm windless day because smelling like an egg is not a good thing. I also went around the yard spraying the hostas and sedums the deer have been helping themselves to. Hopefully it works. Because of our extensive flower beds, this can be a complement to the commercial products we use, namely Liquid Fence and Deer Away which are both quite effective. Slug infestation was another problem we had last year with our cabbages. It is still early in the season but one cabbage plant was already attacked. I was told coffee grounds or sand can be effective. 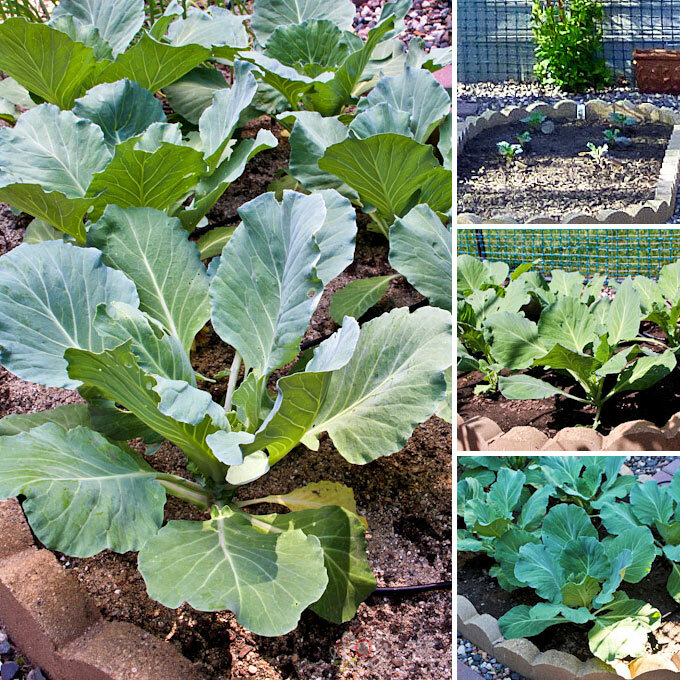 I opted to spread a thin layer of play sand over the cabbage bed after “melting” those slimy pests with a little salt. 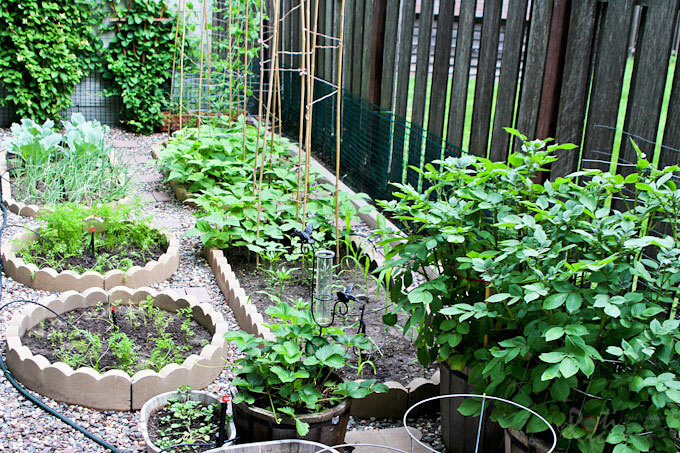 Finally, we come to the fun part of growing the vegetables. 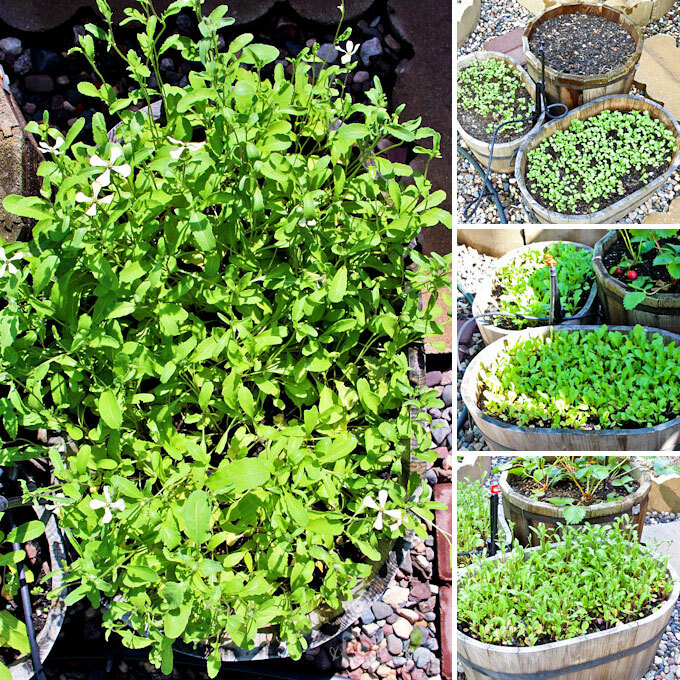 I replanted many of the ones that we enjoy eating and grew well. I dropped those that were problematic and did not so do well. Although we had an initial problem with slugs last year, the crop was pretty decent and we really enjoyed the cabbages. They were so sweet, crispy, and well worth the effort. I made Okonomiyaki with the first harvest of cabbage. 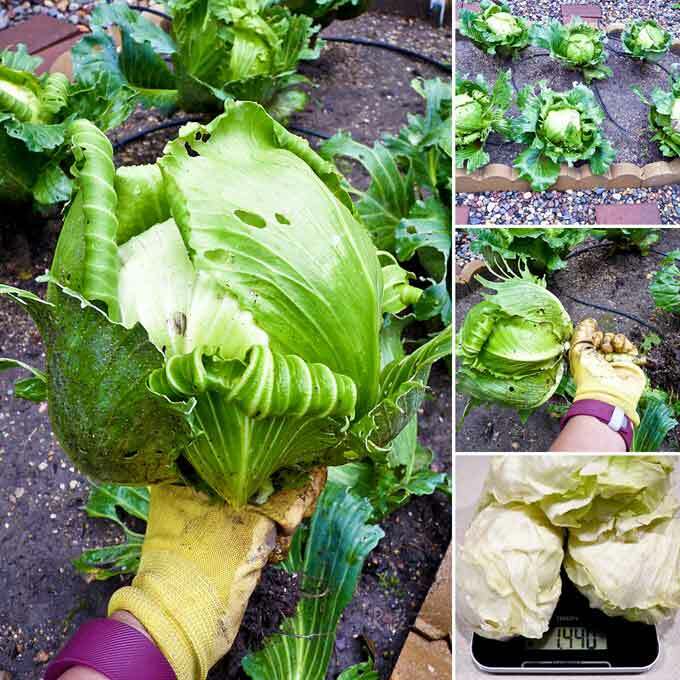 Hopefully this year we will get bigger cabbages free of slugs. From last year’s yield of purple potatoes, I kept some as seed potatoes this year. Purple potatoes make the most beautiful and tasty Baked Potato Chips. 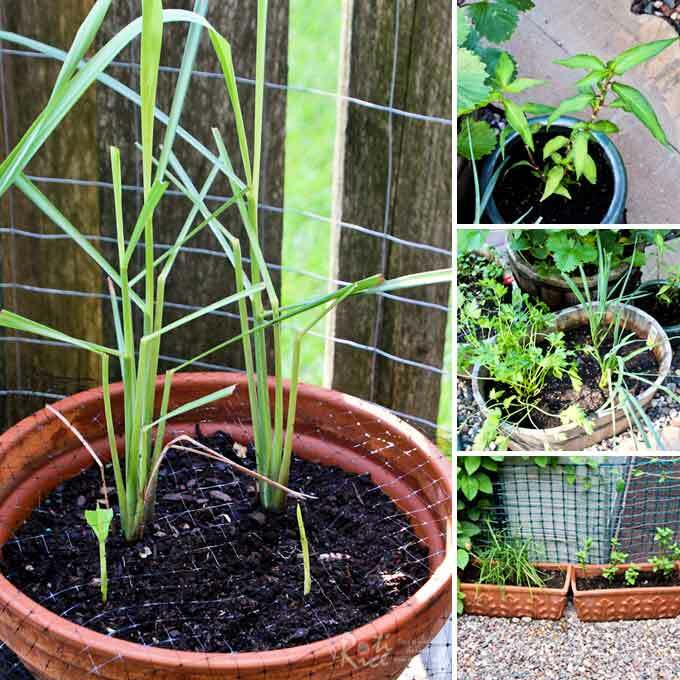 Green/spring onions are really easy to grow and they can be harvested in a month. I recently harvested this year’s crop of over a 1¼ pounds. Recipe for Ginger Scallion Beef Stir Fry will be out soon. In the meantime, please check out last year’s Sausage. Potato, and Egg Skillet. It was delicious! For these green onions, I buried the yellow onion sets a little deeper and closer together (as per packaging instructions) to encourage the green tops to grow. 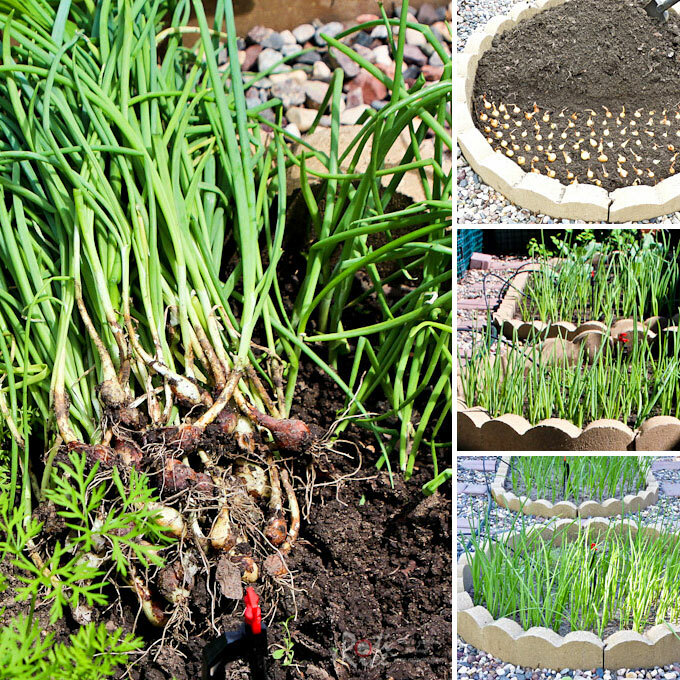 I planted the red onion sets a little shallower and further apart for the bulbs to develop. The red onions are sharing a bed with the cabbages. Sugar snap peas was my pride and joy last year. The yield was over 4 pounds and we enjoyed them throughout the summer. The two recipes I posted were Sugar Snap Peas and Shrimps Stir Fry and Sugar Snap Peas and Squid Stir Fry. Tomatoes are easy to grow and I had a great crop last year. I used some of the cherry tomatoes in this Tomato, Ham, and Potato Skillet and Lentil, Kale, and Roasted Tomato Soup. The Mortgage Lifter tomatoes did not have enough time to ripen but I made the most of it by preparing this Roasted Green Tomatoes and Sweet Peppers Salsa. Due to space constraints in the vegetable garden, I decided to plant the smaller variety of cherry tomatoes in a pot on the patio. I planted three plants each in two separate pots. 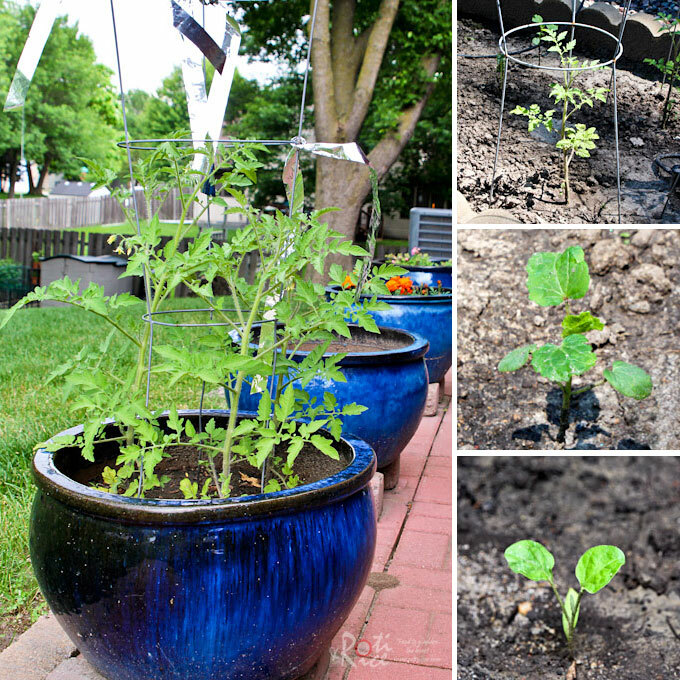 One of the pots did not drain well and so I had to find a spot for them in the vegetable garden. They are already catching up to the ones in this pot. I sowed the remaining okra seeds from last year which did fairly well. They are still pretty tiny because of a cooler spring this year. The same is true of the Asian eggplants. I planted corn as a second crop last year. It grew well but the corn did not have sufficient time to mature because cold weather set in early. I was forced to harvest the baby corn and used them in a stir fry which was really good. Hopefully this year they will have plenty of time to grow and mature. Strawberries were planted in a pot on the patio last year. The juicy fruits were mostly eaten by either rabbits or birds. This year I decided to grow them in the vegetable garden to keep them away from the rabbits. So far I only harvested two very small strawberries. 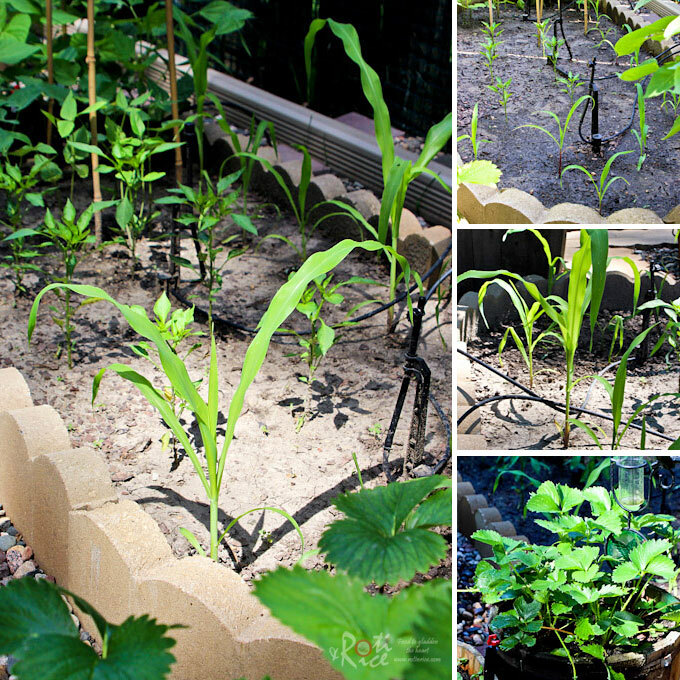 Corn takes up a lot of space and so I decided to clear part of my hosta box to make room for two extra rows of corn. Sadly, those naughty squirrels dug them out. They did not eat the plants but simply broke and uprooted them. 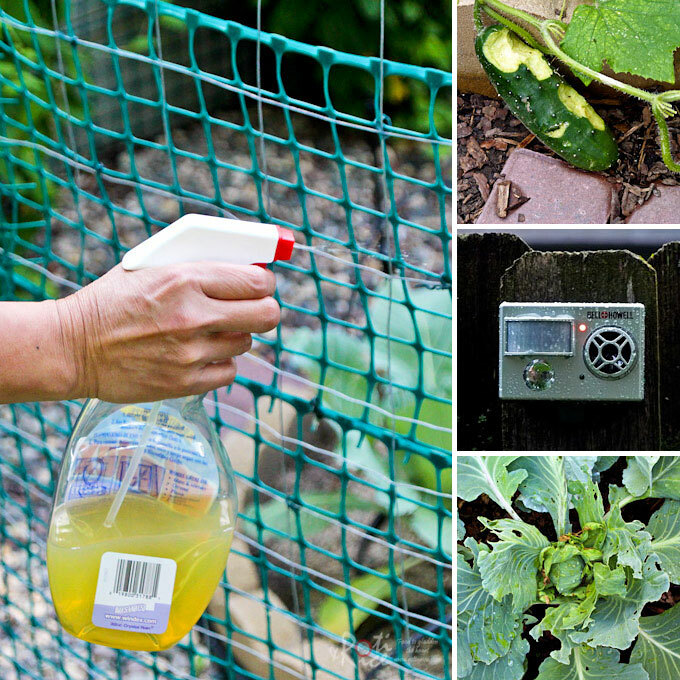 I was not happy at all and have to figure out a way to keep yet another group of pests from destroying my vegetables. Two stalks of corn in the vegetable garden were also uprooted and I replaced them with those out here that survived the onslaught. 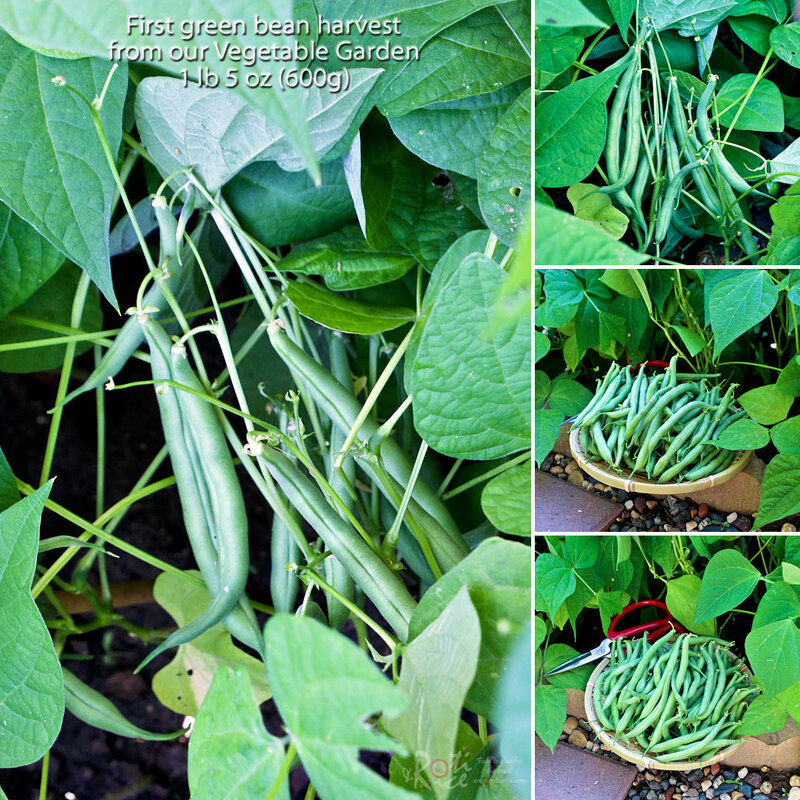 Last year’s green beans were planted the same time as the corn. It too did not have sufficient time to grow. I sowed the remaining seeds this year and they appear to be doing well. I look forward to a good harvest. This is my first time planting carrots. I planted two different varieties. I forgot to keep the packaging and can’t remember what they are. 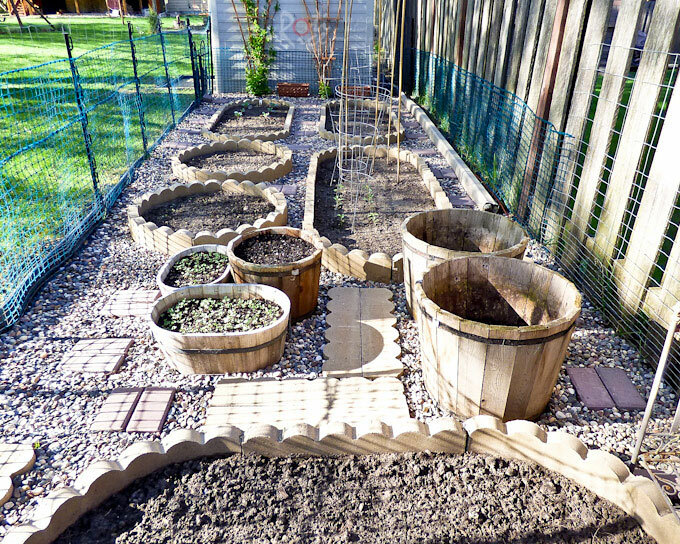 I sowed each variety in half of the two circular beds and spaced them out after harvesting the green onions and baby bok choy sharing those beds. I love spicy food and a good harvest of chilies will be splendid. 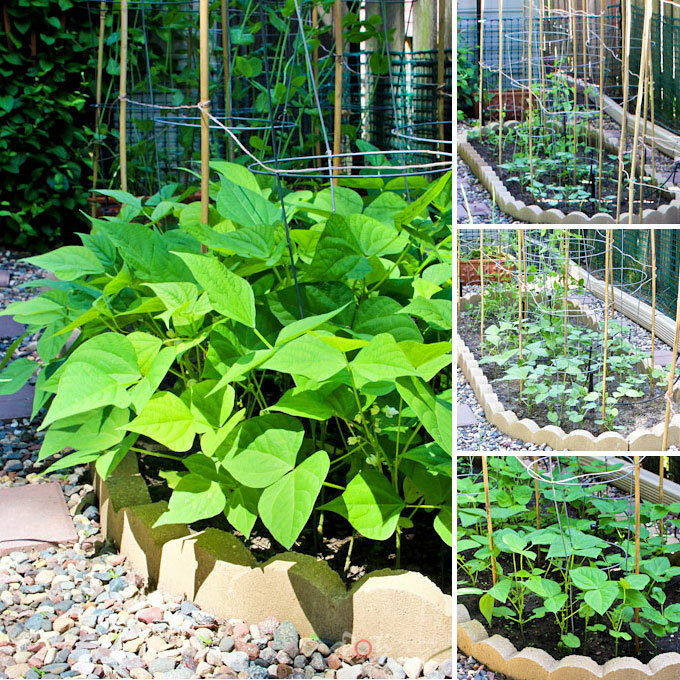 Very early in the season I sowed some long bean seeds. They never appeared. Since they are rarely found at the garden centers, I was delighted to encounter them at the farmers market in downtown Minneapolis. A few more plants would be nice but I am out of space. My arugula was a total disappointment! I sowed the seeds in early spring and it sprouted in just a few days. However, the plants remained thin and slender. Thinking that they needed a little more time in the soil, I waited. To my chagrin, they eventually bolted. I harvested them anyway but the stems were too woody to be eaten. Perhaps I sowed too many seeds in that little planter. I hope to give it a another try. These baby bok choy did a little better than the arugula. They were not the healthiest of plants even though I fed them with an organic fertilizer. The color of the leaves remained a pale green and so again, I waited. They also bolted. I painstakingly separated the leaves from the stems and was able to make a small dish out of it similar to this Yu Choy Sum. 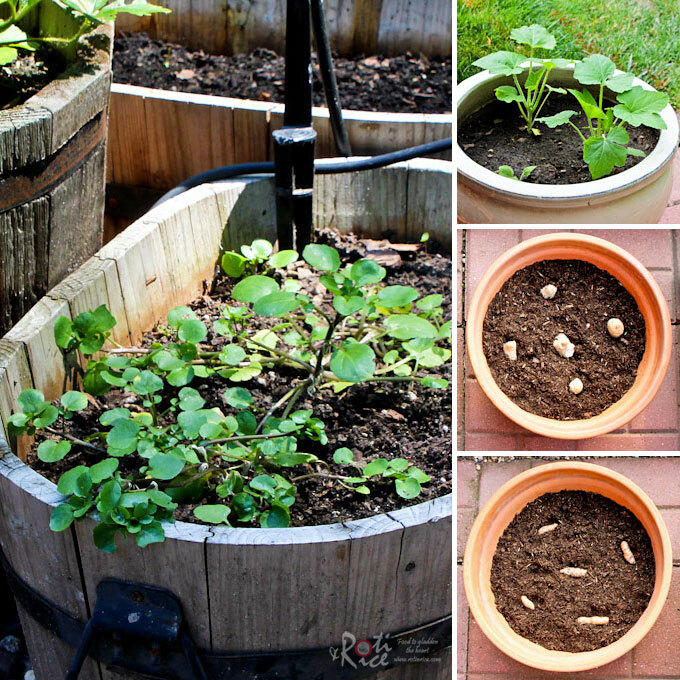 From this experience, it seems like tender salad vegetables are not as easy to grow in my garden. They probably need very rich well amended soil. Hopefully, the compost bin I started last year will have enough material for me to use next year in the beds. I found some organic watercress at the farmer’s market and decided to give them a try. They have spread since I transplanted them. I also sowed some crooked neck squash seeds that my son brought home from school some years ago. I was surprised that they sprouted. 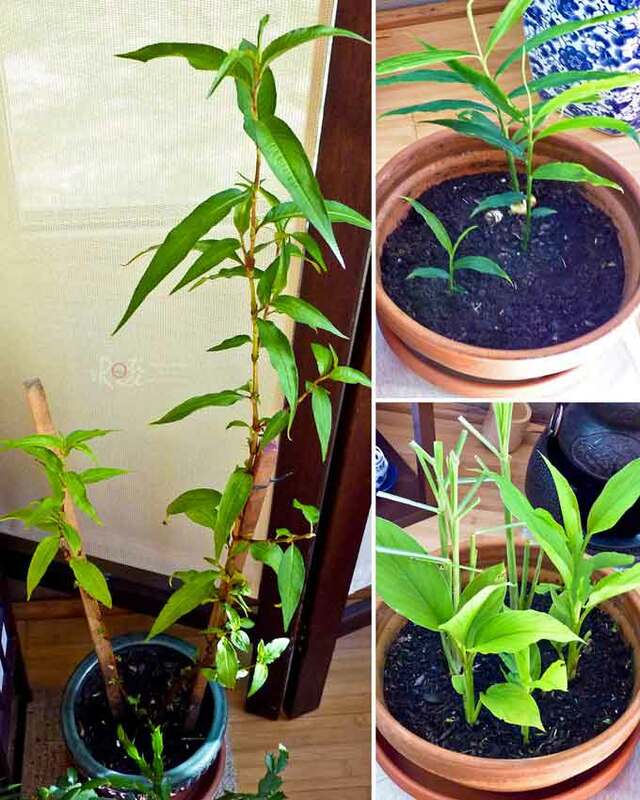 As part of my experimentation I planted pieces of ginger and turmeric to see if they will sprout. The ginger is only just beginning to show some signs of life after weeks in the pot. Since I had a little space for more herbs, I went back to the farmer’s market and to my delight found lemongrass, daun kesum (polygonum/Vietnamese coriander or mint), flat leaf parsley, and leeks. A friend gave me some kuchai (Chinese chives) and mint. 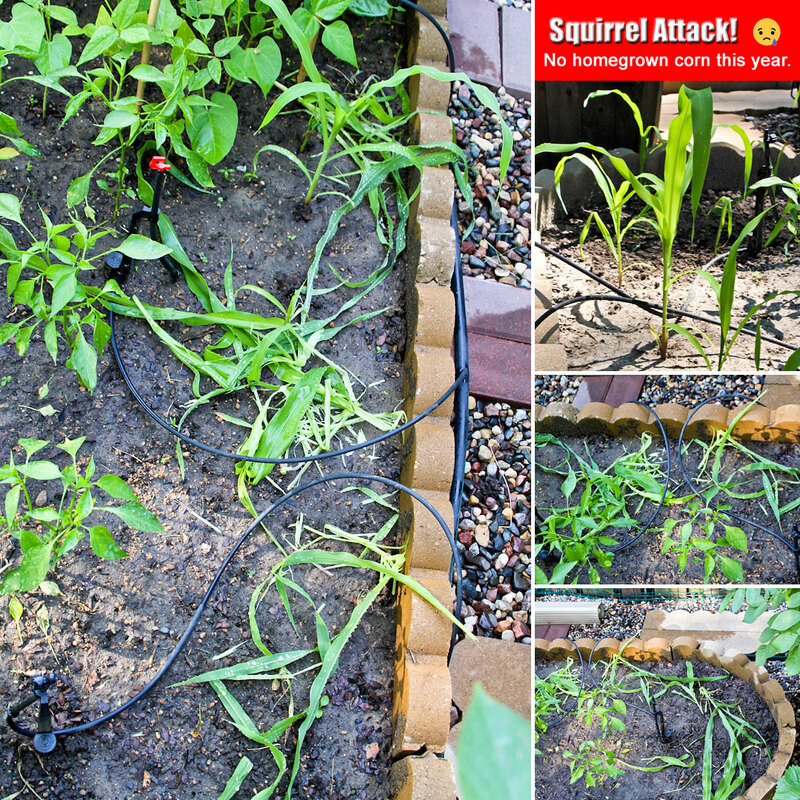 We had a series of unforeseen squirrel attacks on our corn crop. What was left in the hosta box and in the vegetable garden were chewed to bits by these pesky light footed bandits. 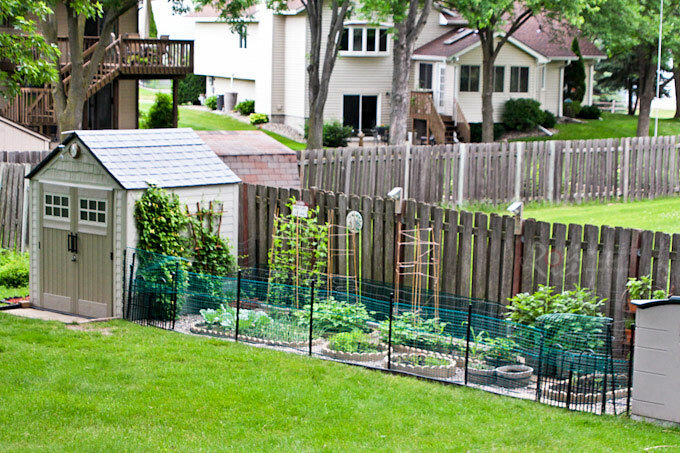 We were able to prevent the rabbits and deer from getting in but squirrels can climb and fences cannot keep them out. Apparently a homemade squirrel repellant of 3 ounces of Epsom salts or 1 teaspoon Lysol diluted in 1 gallon of water works. We will have to try that next year. 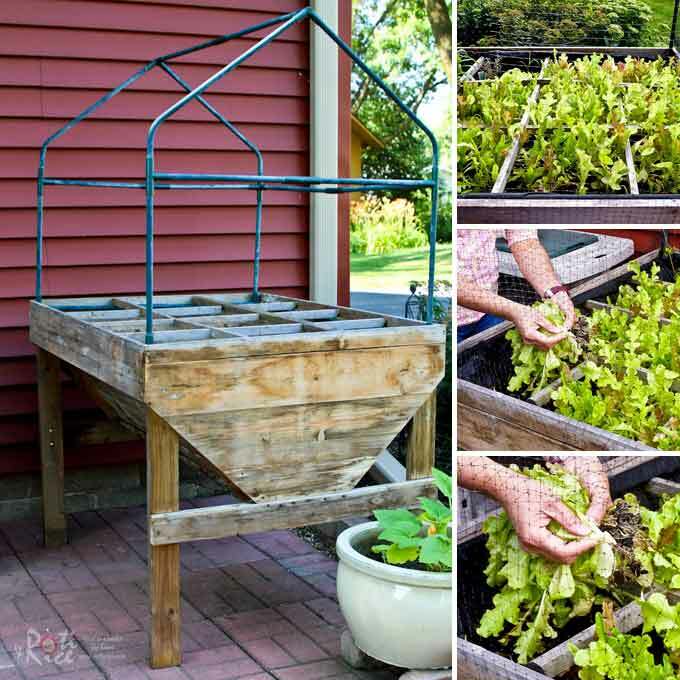 I found this raised planter table for free which I promptly filled with soil and sowed the seeds for these gourmet blend lettuce. They took only 45 days to mature and we had over a pound of super fresh organic lettuce. I used some of it to make this Fresh Fig Lettuce Salad with Poppy Seed Dressing. 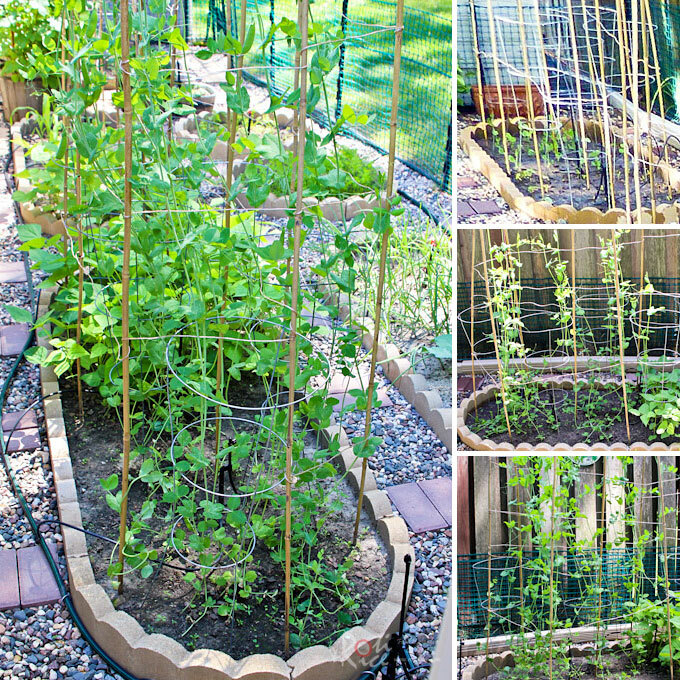 I did not realize green beans come in bush and pole types. If I remember correctly these are the deep colored Blue Lake beans which never climbed up the bamboo poles I inserted into the ground beside them. Still I was happy with my first harvest in early July which yielded over a pound. They continue to produce right through mid August. 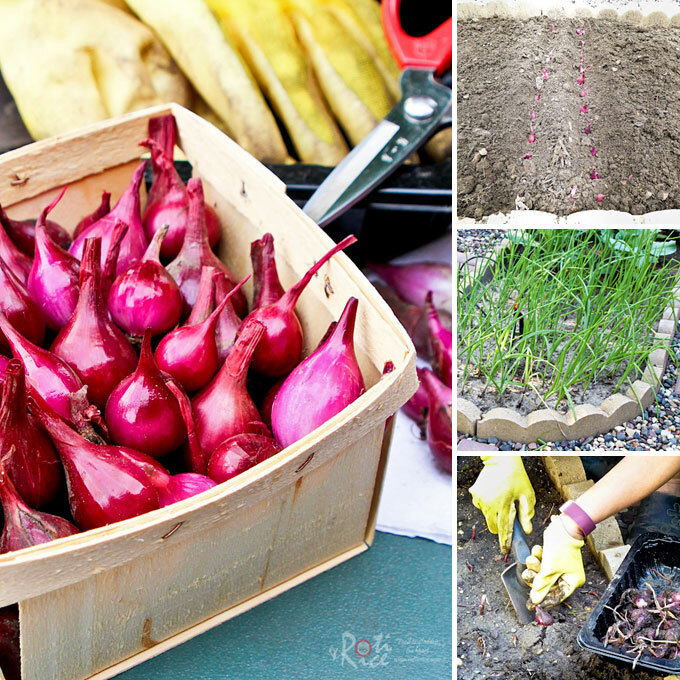 Today, I harvested the red onions (which are more like shallots). They look so fresh and shiny after being cleaned. I’ll be leaving them to dry in the garage for a week or two before bringing them indoors. Update August 15, 2016 : Made this Green Beans Belacan and Green Beans Omelet using some of the green beans and shallots seen here. 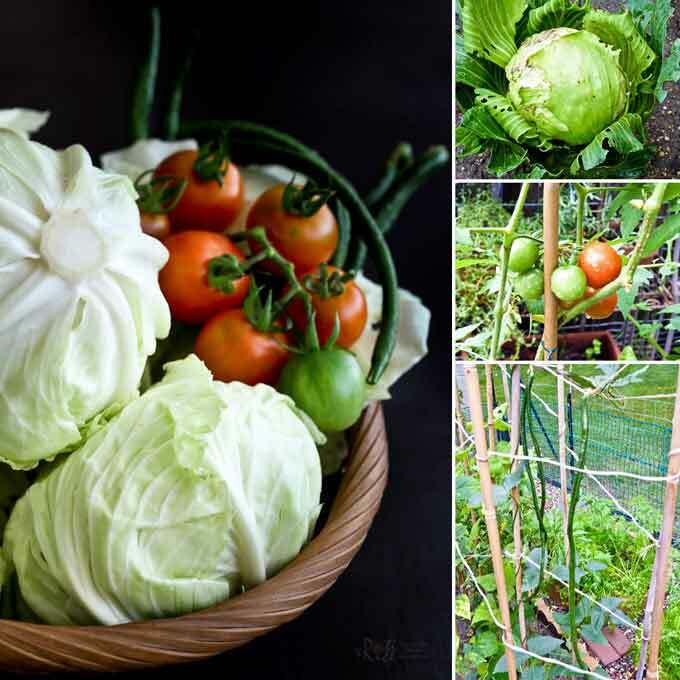 It is always exciting to pull up the cabbages and pick some tomatoes. These were made into Hiroshima Style Okonomiyaki, Okonomiyaki, Roasted Cherry Tomatoes, and Green Tomato Tart. 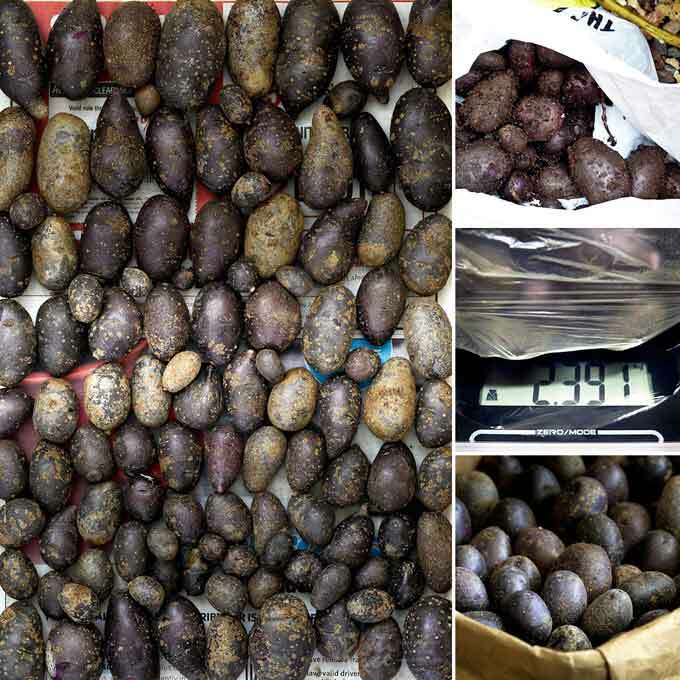 Harvested over 5 pounds (2.4kg) of purple potatoes from the two barrels. The tiny ones will be kept as seed potatoes for next spring. The rest will be roasted and made into Baked Potato Chips. 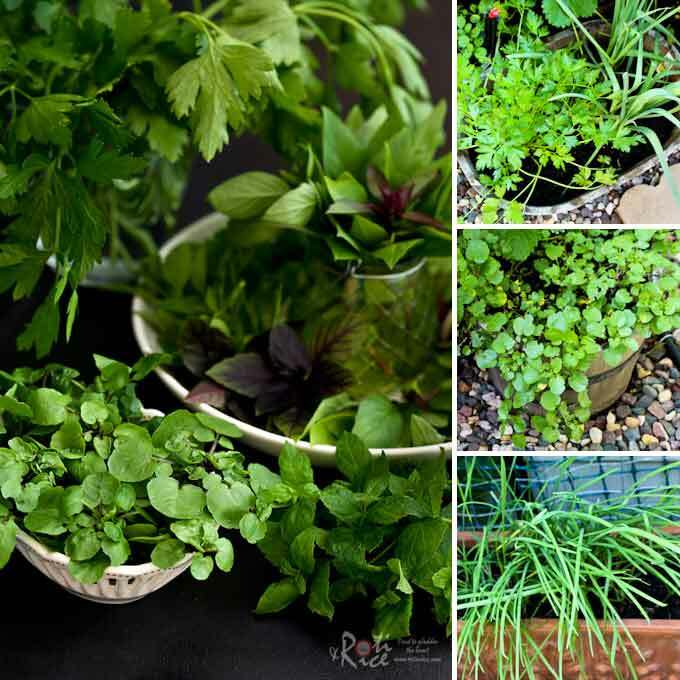 Finally, it is time to bring the tropical herbs indoors so that they can continue growing. Now, I will have turmeric leaves for my Beef Rendang and daun kesum for Asam Laksa. 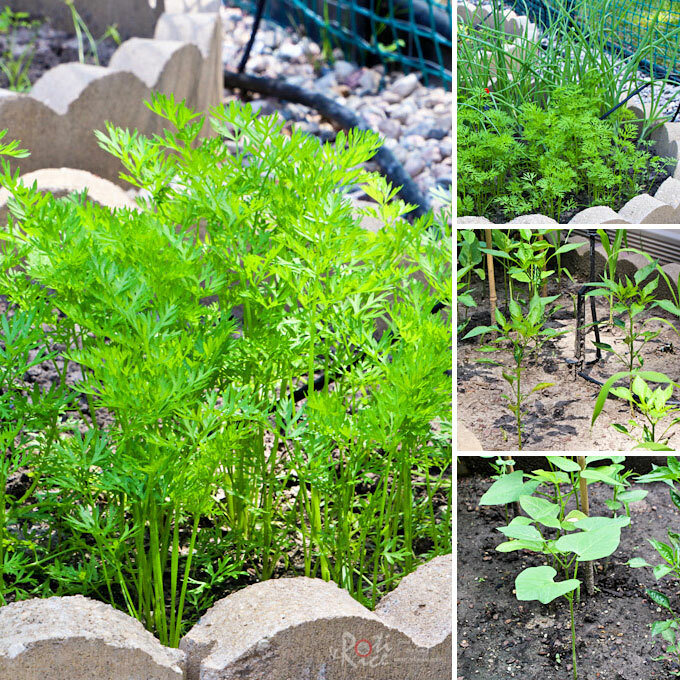 It is also time for me to harvest the two circular beds of carrots. It was a mighty harvest, 8 pounds in total! 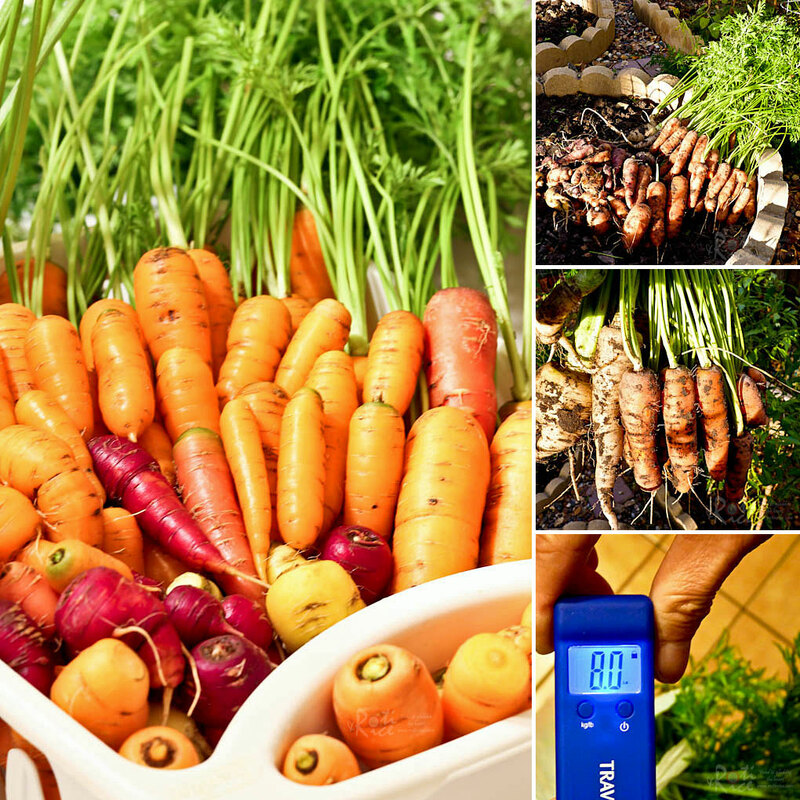 The colorful heirloom carrots were in all shapes and sizes but the orange ones were nice and straight. It did not matter though because they were all good organic carrots. I immediately cooked a bunch (that was bruised during the harvest) in a stew. They were amazingly sweet! Update November 20, 2016 : Updated this Thai Basil Chicken post with new pictures. The dish was cooked using some of the Thai basil seen here.